Goodbye to all of that. So far, not finding Tucson very photogenic. 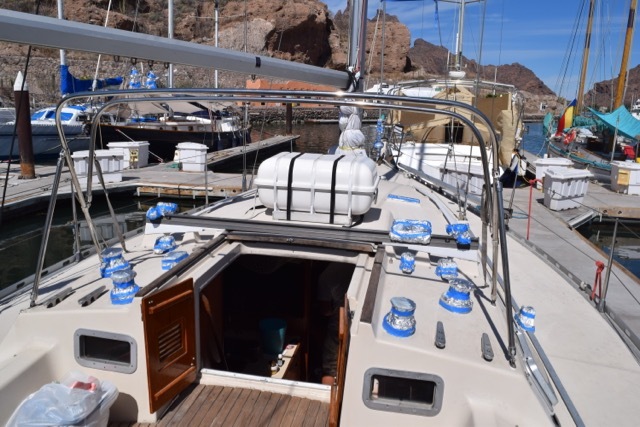 After a very hectic week of wrapping up the boat, pulling all our gear off and schlepping it to Iron Van, we flopped down in the glorious air-conditioning of a nearby hotel room. 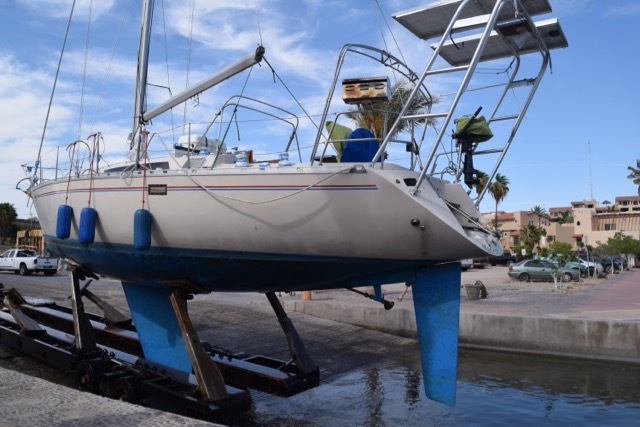 The boat had been hauled out of the water and safely stored in Marina Seca, and we were ready for our exit. 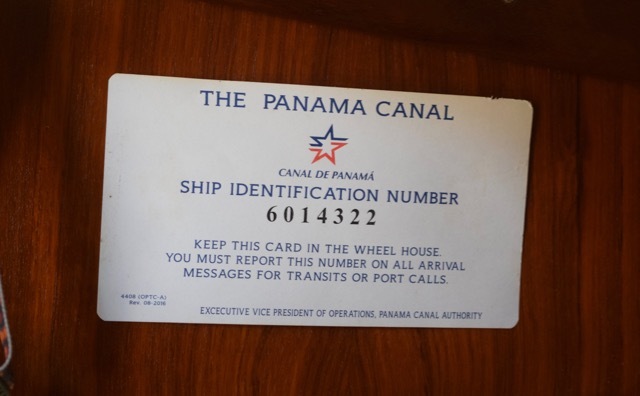 Canal number stays with the boat for life. Man, that seems like a long time ago! Hauling out by tractor in San Carlos. 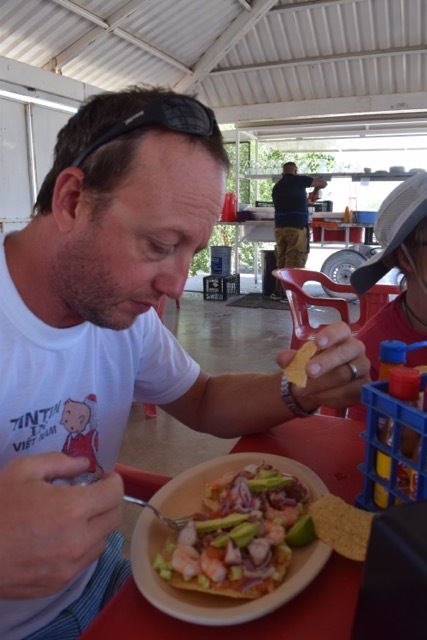 Driving north from San Carlos was easier than expected, and after a last Mexican lunch of cold shrimp tostadas from a roadside stand, we found ourselves at the border. 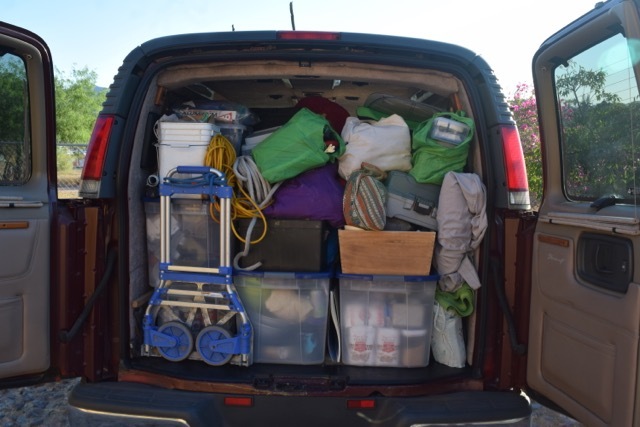 Time for the next test: would we be pulled over and stranded while every piece of gear was pulled from our haphazardly-packed land yacht, searched by customs and immigration for contraband? We couldn’t even tell you what all was in there. The value of foreign-purchased items was impossible to tally; we had two big tubs of food, plus a bag of snacks, plus a cooler–what items aren’t allowed, again? But fortunately, we were waved through without a hitch, and there we were, back in the United States. Please do not ask me what is in here. We immediately noticed how insane the roads are. Yes, it’s luxurious driving on four lane highways with actual shoulders, rumble strips, guardrails, and consistent signage (in English!). But we have been in no other country where millions of dollars have been spent on huge overpasses and interchanges everywhere, just to allow drivers to go a little faster. Costa Rica puts their resources into conservation and universal health care, instead. Our brains are still trying to operate in Spanish. For every transaction, we pull up the required vocabulary from the depths of our brains, and are startled when everyone comes at us with English. Tucson is very easy to navigate as a visitor–if you have a car. We’ve been able to find what we need and move around so efficiently, we’re ahead of our game plan. That plan involves decanting our gear into a hotel room; sorting out what can be shipped to my cousin’s house in Madison; and repacking Iron Van with only what we need for a couple of months of camping and visiting friends and family. Our house rental doesn’t start until August 15, so we don’t plan to be back in our hometown until early August, giving us two whole months to try and acclimate to the pace of life in this country. Everything is fast, everything is efficient, everything is expensive. We’ll adjust. Meanwhile–the beds are huge! And slightly dangerous; we haven’t been able to fall out of bed for years, and T found the limits of his bed this morning at about six am–fortunately landing on a pile of clothes waiting to be sorted. We completely lost our heads at the local grocery co-op, Food Conspiracy, and spent and outrageous amount of money on what was basically lunch. We had Thai food last night, and it was a religious experience. Mostly, we’re overwhelmed by the amount of merchandise. We’ve absorbed more advertising in the last 48 hours than we had in the previous six months, and the sheer number of things for sale seems to be impossible. Who is buying all of this stuff? Later today, we’ll be attempting to navigate REI without losing our minds. We have a list. We’ll see how it goes. Obviously, we can’t stay in this situation for very long without being completely overwhelmed, so in a couple of days we’ll decamp for the Grand Canyon. We plan to head to Desert View, to avoid the crowds and find some space in nature. We find the lack of water disconcerting, but are looking forward to time away from this concrete environment, and back to a desert landscape. Mount Lemon is a nice sight in Tucson. (I have family there)… but that’s tiddlywinks compared to what you have experienced. I could have answered your questions about the border before you arrived 😁. “excessiveness shock” in so many ways seems to be hitting you guys as you re-enter the USA? The Grand Canyon should revive you nicely. Enjoy!